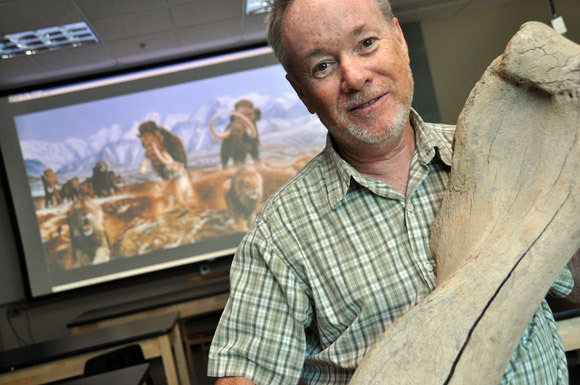 Rob Young, associate professor of earth and environmental sciences at UBC's Okanagan campus, holds a fossil from the humerus of a Woolly Mammoth Mammuthus primigenius. The bones are on loan to UBC from former student and current Yukon paleontologist Grant Zazula. As Associate Professor Rob Young carefully reveals his newly-arrived Ice Age artifacts -- a horse skull, mammoth bone and bison skull -- he reminisces about a time when super predators and giant beasts ruled the unforgiving wilderness. "These Ice Age pieces, found in the Yukon, are very rare. Horse skulls in particular are easily broken up; it's unusual to find one still intact," explains Young, who teaches Earth and environmental sciences in the Irving K. Barber School of Arts and Sciences at UBC's Okanagan campus. "It's quite amazing to think that these pieces belong to animals that lived in a time where a 2,000-pound giant bear could run as fast as a race horse and lions were double the size of what they are now." Young will showcase the horse skull, mammoth bone and bison skull on Saturday, September 29, during UBC’s third annual Community Day at the Okanagan campus, featuring a variety of free and fun-filled activities for people of all ages. The day offers campus tours, displays, children's activities and a complimentary lunch. Young is also one of six UBC experts giving 15-minute talks about their latest research and academic passions. The talks will take place on the first floor of the Engineering, Management and Education building in rooms EME 1202 and EME 1203 between 11:30 a.m. and 2 p.m.
Young's talk, Out of the Ice, offers a brief glimpse into the Ice Age and the enormous beasts and ferocious predators that dominated the terrain; it also examines the fundamental transformation of the Earth's environment, and how the past continues to reveal clues about our future. "Our perceptions of the Ice Age are often inaccurate," he says. "It's important we understand what the Ice Age was really like. The mammals we know today -- elephants, lions and bears -- are just a vestige of their former selves, and could never survive in the areas that their ancestors thrived and conquered." Accounting Matters -- What do you need to know about recent accounting scandals?At this session, Senior Instructor Sandy Hilton, Faculty of Management, will break down a few well-known corporate scandals and show you how knowledge of these scandals can help in your wealth-creation and retirement strategies. Comic Con is EducationComic Con is the biggest comics convention in the world, held each year in San Diego and Associate Professor Vicki Green, Faculty of Education, has been an avid participant since 1974. She leads a conversation about Comic Con, addressing questions such as What is it like at Comic Con? Where do you find the results of Comic Con? How is Comic Con reflected in daily life? Who participates in Comic Con? The Eco-Art Incubator and the Ecology of BelongingAssistant Professor Denise Kenney, Department of Creative Studies, discusses the Eco-Art Incubator Project, an arts initiative designed to renew attentiveness to place by situating itself at the intersection of human activity and a fragile dryland region undergoing radical urban and agricultural development. The project's goal is to not simply generate a series of works of art, but to seed long-term practices and to create case studies and models for future communities and art-makers. What is MAGIC about Marketing? The rationale behind marketing techniquesAssistant Professor Ying Zhu, Faculty of Management, brings a deep understanding of marketing and marketing techniques. Her discussion focuses on a number of questions: Why are we willing to pay three times more to buy a particular brand of coffee? Why are we so obsessed by the word “Free”? You are looking at a product that is 50 per cent off and you will get additional 10 per cent off on top of that. Does it equal to 60 per cent off the total price? Why can our decisions be easily changed by the structure of the options we receive? The Climb for Research: A scientific expedition explores human physiological adaptation and maladaptation to high-altitudeAssociate Professor Philip Ainslie, School of Health and Exercise Science, led a 25-person team of international scientists on a six-week research expedition to Mount Everest’s Pyramid Laboratory, located at 5,050 metres, last spring. Ainslie will discuss his research to increase understanding of severely reduced oxygen delivery and blood flow to the brain and vital organs that is associated with high altitudes -- characteristic of many chronic conditions, including heart attack, stroke and respiratory failure. UBC Dialogues: What’s the Real Cost of Cheap food?Another part of Community Day is UBC Dialogues, a provocative panel discussion that delves into pressing issues facing society. This free event runs from 2:45 to 5 p.m. in the University Centre Ballroom UNC 200 (3272 University Way, UBC’s Okanagan campus, Kelowna).Moderated by CBC Ideas host Paul Kennedy, the topic is What’s the real cost of cheap food? Most people want to make sustainable dining decisions but busy lives and tight budgets mean imported and processed food often wins out at the dinner table. Hannah Wittman, assistant professor with the Faculty of Land and Food Systems and the Institute for Resources, Environment and Sustainability, UBC’s Vancouver campus.